Neil was interviewed by ChartAttack magazine, where he discussed the new album, Roadshow, and what kind of hats he likes to wear. Thanks to Rushisaband for posting this. Neil Peart has been busy. Since returning to full form in 2002, the 54-year-old drummer for Canadian mega-rock trio Rush has been preoccupied with a series of personal and professional projects: two studio albums, subsequent concert tours, DVDs, a website, and the writing of three books, including his latest work, Roadshow: Landscape With Drums. Speaking on the phone from a Toronto recording studio where he and bandmates Geddy Lee and Alex Lifeson are at work on their 18th original studio album, Peart explains his motivations for chronicling his motorcycle journeys during Rush's 2004 30th anniversary tour. "This book works on different levels," he says. "On the one hand, it became the logical culmination of so many desires to try and explain what it is really like to be a touring musician and the kinds of personal and artistic conflicts that exist in trying to survive and make a living doing something creatively satisfying. "At the same time, it is a travel diary of sorts, as I have a passion to communicate what I see and who I meet when I am out there on my bike." As the longtime beat-keeper and lyricist for his band, Peart is no stranger to shifting gears. "It's a little like juggling hats," he says. "When I'm writing lyrics I always wear a cowboy hat, because I figure that you can never take yourself too seriously with a cowboy hat on. "And then when I go in and work on drum parts, I'll put on my little African hat. Then, when I am writing prose, I'll wear either my BMW motorcycle hat or a Toronto Maple Leafs hat." Prejudice aside, Peart can be forgiven for that indulgence. "Ha! To be honest, I am not a hockey fan at all... I just happen to like the hat," he admits. "Certainly, however, there is both a distinct physical and psychological adjustment that occurs when changing hats, as each has specific requirements. Thankfully, I like all of my hats." For Roadshow, Peart exchanged his musical toque for a writer's cap as he made the transition from lyricism to literature. "As I describe at the end of the book, after the last concert in Europe, I literally and figuratively put down my drumsticks and walked offstage into the world of prose writing, which is a whole other mindset altogether for me. "I have learned that there is a fine line between the art and craft of writing. One is strictly a concise creative endeavour, while the other seeks to broadly capture and communicate experience. As such, like good journalism, prose writing is very freeing in that it seeks to record and relay those experiences on a much bigger canvas. The challenge of lyric writing is to try and condense big themes and big ideas into a much smaller space. "With Roadshow, the key phrase, as it always has been, was that little writer's exercise that always plays in my head. How would I put this in words? How can I best capture this feeling, or this view, or this experience? "I worked a lot on the presentation of structure, and especially the handling of time, because I wanted to make a flowing narrative of my day-to-day journeys. At the same time, I had a lot of history to get in there, so there was a real drive to reconcile those two elements. Still, I am very satisfied with the book in the sense that I feel like I've been able to convey my observations from that period in an exact and effective manner, while still leaving some room for matters of personal opinion." Having hung up his literary lid for the time being, Peart has once again thrown himself back into music. "I've just finished all the lyrics for the new album, which will be out next year, and so I'm back into the headspace of drumming and trying to challenge myself by experimenting with new set-ups and sounds. And, of course, the language of rhythm requires a completely different kind of hat." 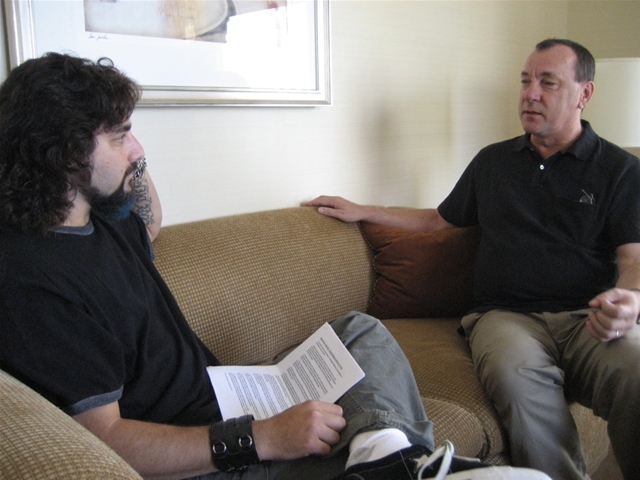 Mike Portnoy recently interviewed Neil Peart for Rhythm magazine. He also interviewed Nick Mason (Pink Floyd), Bill Bruford (Yes, King Crimson, solo), and Lars Ulrich (Metallica). Mike posted a picture from the interview along with some information about this project. Go to Mike's website post. "Neil was the first to get together with me as we were able to spent some time together while he was in NYC in September doing some promo for his latest book. Finally meeting him was really a cool experience as he's really one of the only drum heroes of mine that I hadn't met yet through the years. He was totally accomodating and friendly and he opened up to me on everything from his early influences to the writing and recording process in Rush. (and I must admit the "fanboy" in me couldn't resist having him sign one of my custom drums from my "Cygnus and the Sea Monsters" kit!)" Recently, Neil gave Rick Mercer (of CBC) a drum lesson at the Rush Batcave in Toronto. http://www.cbc.ca/mercerreport/video_player.html?neilpeart Rick Mercer Report Enjoy! Neil has published Issue 6 of his Quality Reading column. In this issue, he reviews A Complicated Kindness, by Miriam Toews. Rush.net has posted an announcement about a preview of the Aqua Teen Hunger Force movie. You can read the announcment here. Neil Peart will appear on the Rick Mercer Report Tuesday night (Nov. 7) at 8 pm on CBC. Evidently, Neil is going to give Rick some drumming lessons. Thanks Sam Albidone for the head's up. Read the announcement from Rush.net.